Evgeny Kot from Dart Russia is frequently speaking about the benefits of using Dart and changing the perception and excitement about Dart in the developer community. Read more about how personal commitment and power of community can go a long way when spreading awareness. Evgeny, you work for a company that uses Dart for its project management software product. How did having a day to day experience with Dart influence your willingness to start a community around Dart? There was little to no community around Dart when we first started using it in 2014 at WRIKE. It was hard to share our knowledge and experience. 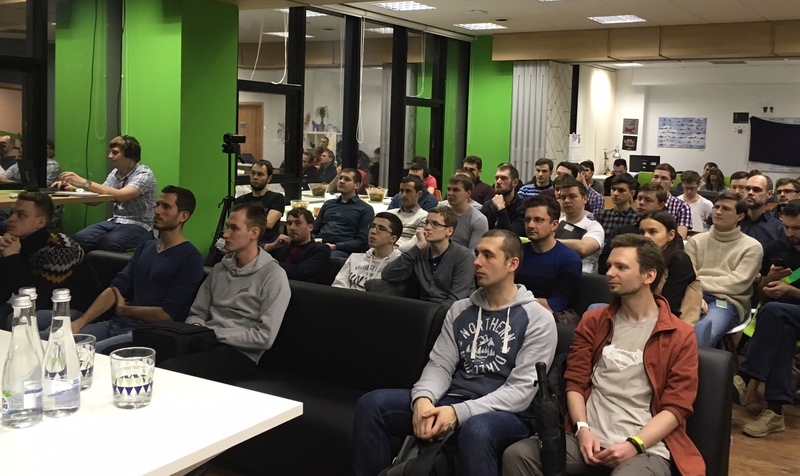 We decided to change that and organized our first meetup in Saint Petersburg for ~30 people. Then, after various conferences and events, people started using Dart just to play around while others started using it to work on projects. Gradually, a small community began to form and grow around the language. My hope is that this process will continue. We hold annual conferences and various small events to support this growth. We welcome all Russian-speaking developers from around the world in our community Telegram chat. I’m convinced that Dart as a platform and language offers a solid foundation for developers. That is why I started to speak at conferences to promote it. What do you like about Dart? It seems that you really enjoy working with Dart. Was it easier for you to speak in public about something you’re passionate about? I definitely had to train for public speaking, but you’re right in saying that it’s easier if you’re speaking on a subject you know and like. Public speaking is like a sport, the more you do it and train, the better you get. Positive feedback also helps to gain confidence. As the community grows (we currently have ~300 members), there are many other talented speakers that help to spread the word about Dart, and I’m very thankful to all of them. It’s a team effort for sure. Do you curate the conversation on your social channels? We have two moderators from our team to filter spam and inappropriate messages. Although, we don’t have a formal code of conduct, the informal rule is to ‘be polite’ and we block users that don’t comply. Since the community is still very young, there are a lot of questions from new members. We make sure these questions get answered. Recently, with the release of Flutter, we see a lot of new excitement and discussion on our chat. We’re a core team of 2 people. My friend, Anton Anokhin is a great organizer of ‘things and people’, and I’m usually the one who speaks. Our main meetup is our annual conference that ~200 developers attend. Having WRIKE being our main sponsor, makes everything a lot easier. We make sure to have a great venue and take it a step further with every event - in 2017 we had a special dark ‘Dart’ beer brewed just for this event. And we gave it as a gift to the Dart developers (laugh). You learn with every meetup you organize. I’m a perfectionist and I pay a lot of attention to details, but there will always be things that won’t work out. There will always be ‘something’ with the equipment or other technical issues, but you have to be able to deal with the situation and learn from it. In the end, the most important thing is the interaction between the speaker and the audience. This year, we have plans to organise an even greater event, so stay tuned! (Join us in Telegram, follow Twitter, or Wrike Tech Club). So the conference is your main meetup and for the rest of the time the community meets online? We also organize some smaller meetups,like the DartConf afterparty, and we also help our friends from other communities with spreading awareness. We stream all of our meetups on YouTube. My advice to anyone who considers live streaming: the absolute minimum is having one camera for capturing the speaker. You’ll need a projector for slides, one lapel microphone (we use SENNHEISER). You’ll also need one (or more) hand microphone(s) for questions from the audience. You should record the speaker screen (we use screen capture device like AverMedia). Live streaming adds value to your meetup, but the most important thing is still getting together as a community. What do you like the most and the least about being a community organizer? I’m always happy to see new people joining the conversation about Dart on our chat, using the programming language, and becoming aware of its potential. I don’t like the bias about Dart being ‘uncool.’ I get these comments all the time and it’s a bit tiresome, but I’m aware that this is something that might never go away as there will always be people favoring their (different) programming language of choice. Are there any unique challenges you’re facing at the moment? Our main challenge to figure out how to scale and grow the community, while continuing promoting Dart and creating new communities. Anyone interested can contact me on Twitter. It would also be nice to have a little more time for all these community activities (laugh).